Welcome to the world of blogging! A blog is a platform where you may jump up on your soap box and say what you want or use it to record your knowledge and understanding of a topic. Is this a valuable Web 2.0 tool for the classroom? As Sarah Palin may say, “You betcha!” Using a blog is like journaling, only once you have written your piece, you allow peers to read, reflect, and comment on one anothers’ work. Teachers are using Internet technology creatively and putting the blog to work in the classroom. An education blog can be a powerful and effective tool for students and teachers alike. Blogging is a confidence builder. Students are very proud to have their work featured on the internet. The students will be thrilled to have their work posted and read by all. Blogging is cross curricular. It offers students an opportunity for authentic reading and writing. Because it is dynamic, it provides students with an opportunity to develop their geography skills as they place the commenters to their posts. Additionally, the comments can be counted, graphed and worked into word problems (how many more posts came from Ohio than from all other states?) It also offers opportunities to teach students about digital citizenship. Students can grow and learn as they develop effective forums for collaboration and discussion. The writing is authentic because the students are writing about what they want. Even if I give them prompts to write about, they know teachers and other students will be reading them – not just me. When they realize they have an audience waiting to read what they have to write, it is motivating. It allows the students to “toot their own horn” if they wish. It builds their confidence when other teachers and administrators chime in and make comments of their own! Exposure to technology that students might not otherwise receive, especially if they do not have computers at home. Blogging in the classroom is a novelty that is fresh. It provides students with experiences can be a time to collaborate. Often classroom teachers do not have computers for everyone. When this occurs, students must take turns, converse, help each other spell, share the computer, and problem solve. When students blog on a regular basis, the teacher can see their daily/weekly progress. Often times, teachers use early blogs as a baseline for growth. When students are writing their blogs on their own, they can get quite a sense of accomplishment as they review their early work. 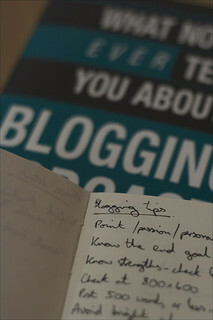 Blogging image by Andy Piper (CC BY-ND 2.0). Interesting idea. Do you think that blogging should be an outside of classroom activity? I’m curious if students would resist as sort of “blog on command” regime in the classroom. but be more open to it on their own at home. Do you see the obviously public aspect of blogging as having a different effect than bulletin board conversations such as are typical in most e-learning systems?